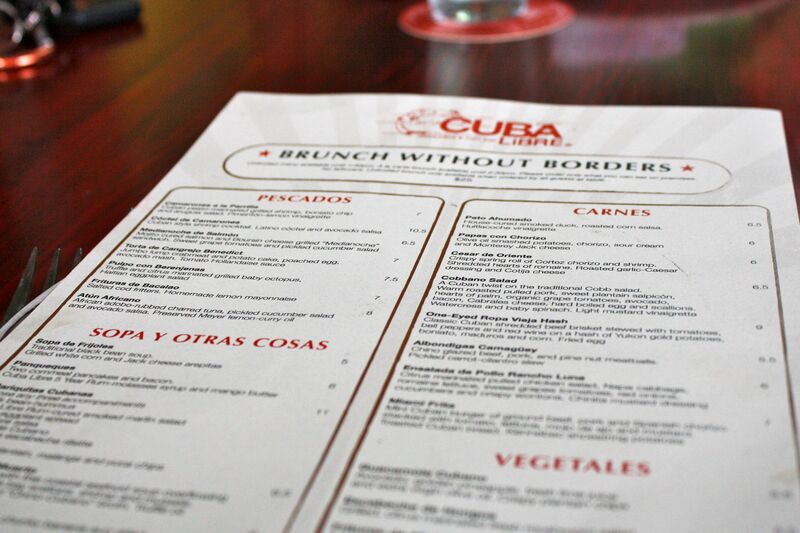 When I was invited to a bloggers’ lunch at to check out Cuba Libre’s new Brunch Without Borders menu, I jumped at the opportunity. 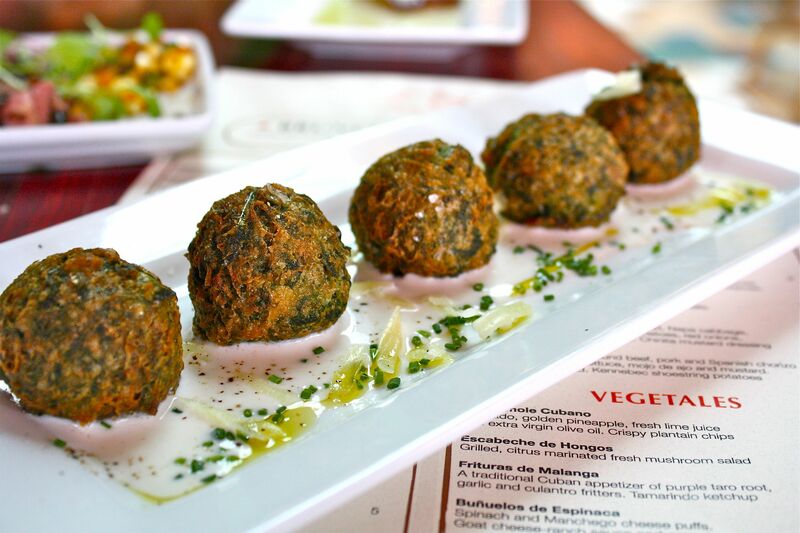 I had never been to Cuba Libre and am not as familiar with Cuban food as I am with other cuisine. I dragged my very willing (all you can eat brunch!) husband along to check things out. 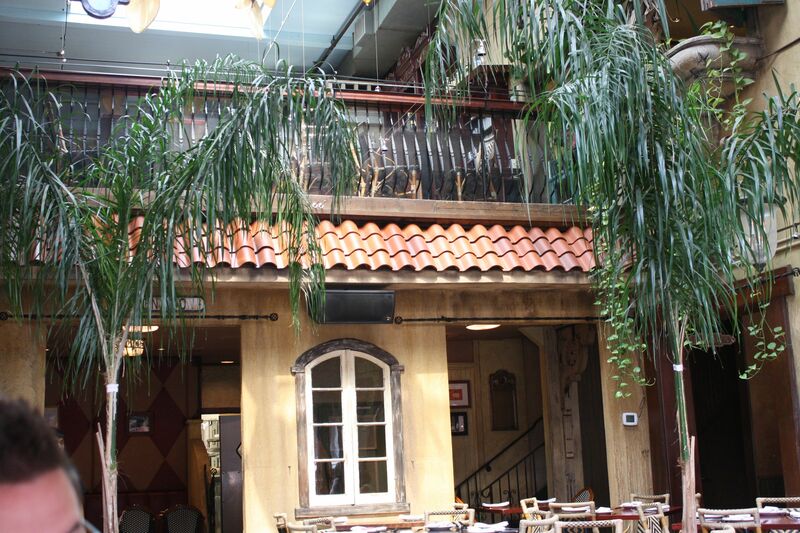 We walked in and the decor looked exactly like a Cuban garden cafe (or at least what I would imagine it to look like.) It was bright, lush and airy. I skimmed the broad range of offerings and began to plot my meal. There were so many tasty looking offerings. 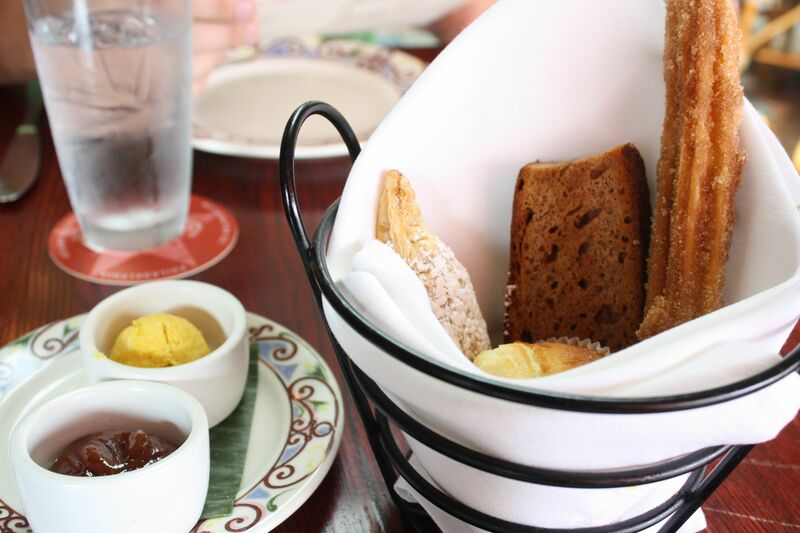 As we discussed our options, a bread basket was delivered to our table with a churro, muffin, banana bread and a guava cream cheese “hojaldre” pastry with mango butter and guava preserves. Oh my. We decided to order a handful of items to start and we held onto the menu for later rounds of ordering. First up was the cuban style shrimp cocktail. For someone who doesn’t normally love shrimp, this was one of my favorite dishes of the day. It was swimming in a tangy cocktail-style sauce slash gazpacho that left me clamoring for more. 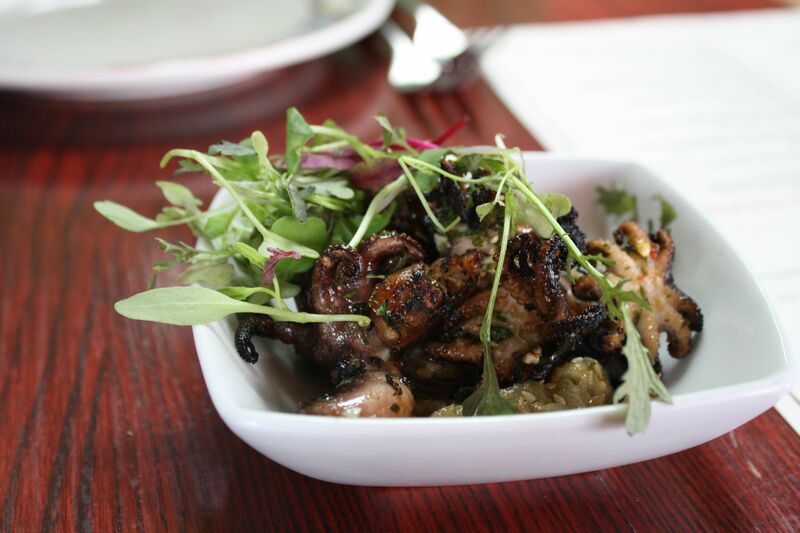 Continuing on our seafood tour, we had the truffle and citrus marinated grilled baby octopus over eggplant salad. This dish was surprisingly cold and refreshing but didn’t have quite enough of that charred flavor as I would have liked. Next up was their version of Eggs Benedict. 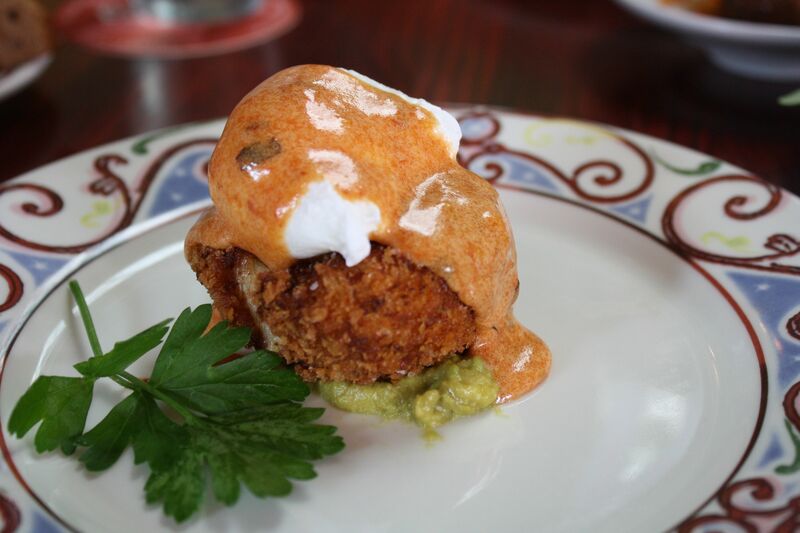 A crabmeat and potato cake topped with a poached egg, avocado and a tomato hollandaise. I love crab and I love eggs benedict, so this dish was a no-brainer to me. While it was good, the potato-crabcake had a little too much potato and not as much crab, which took away from the subtle sweet flavor I enjoy in crab. 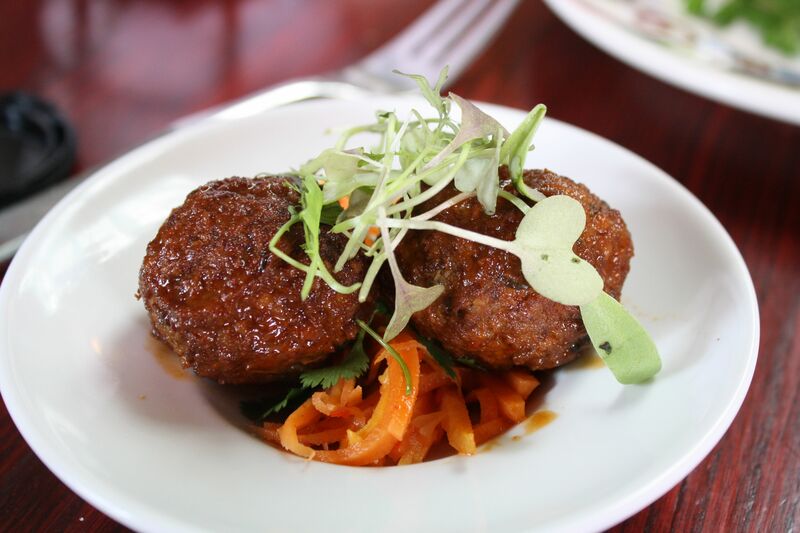 We moved on to land with the beef, pork and pine nut meatballs. This was probably my least favorite dish of the day. Nothing quite wrong with it, the flavors just didn’t stand out like the other dishes did. Now we’re getting to the good stuff! The meatballs came with what my husband described as the “ultimate stoner food.” Papas con chorizo are smashed potatoes with chorizo, sour cream and monterrey jack cheese. Mmmmm…extra points for an adorable serving vessel! To accompany the stoner food, we had to try the beef, pork and chorizo burger slider. I let my husband eat most of the slider as I was completely enamored by the shoestring fries. 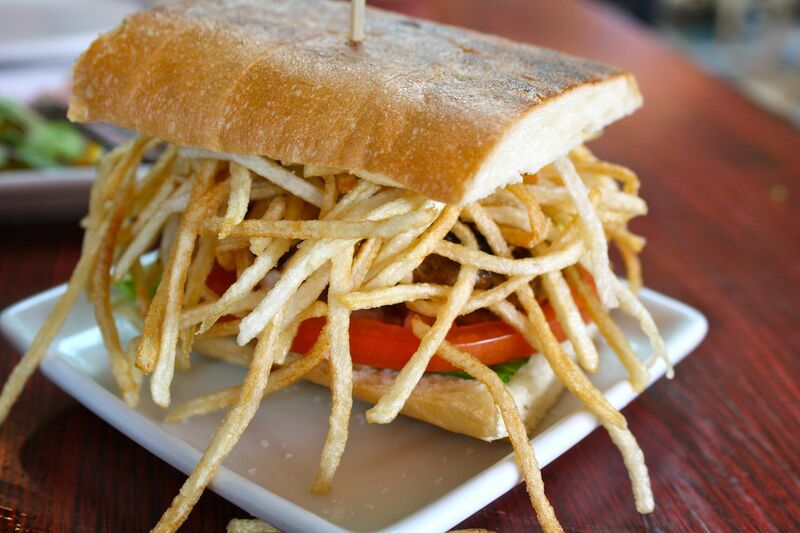 I really dig an authentic (read: super thin) salty shoestring fry. And they put them ON the burger. 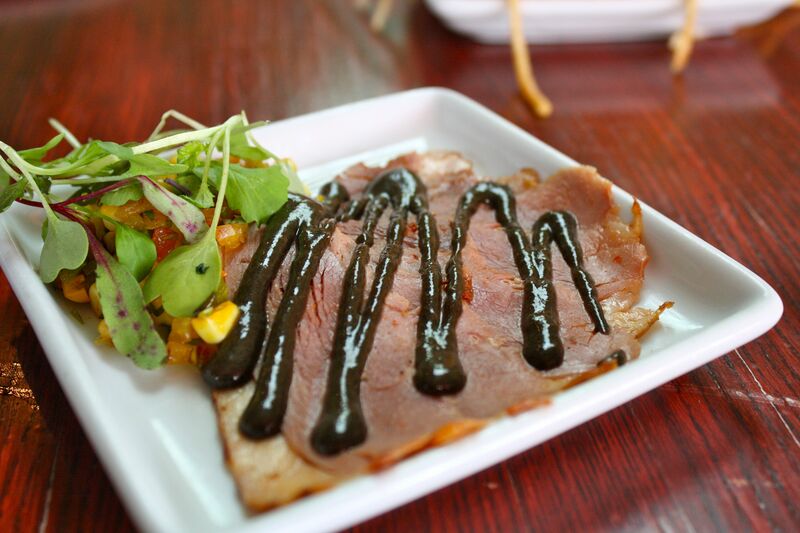 After a few heavier dishes, we lightened things up with the house-cured smoked duck with huitlacoche vinaigrette. I had to Google huitlacoche to make sure I spelled it right. I’m always a sucker for a smoky flavor and this meat did not disappoint. The vinaigrette added a nice tang to the rich smokiness of the meat. 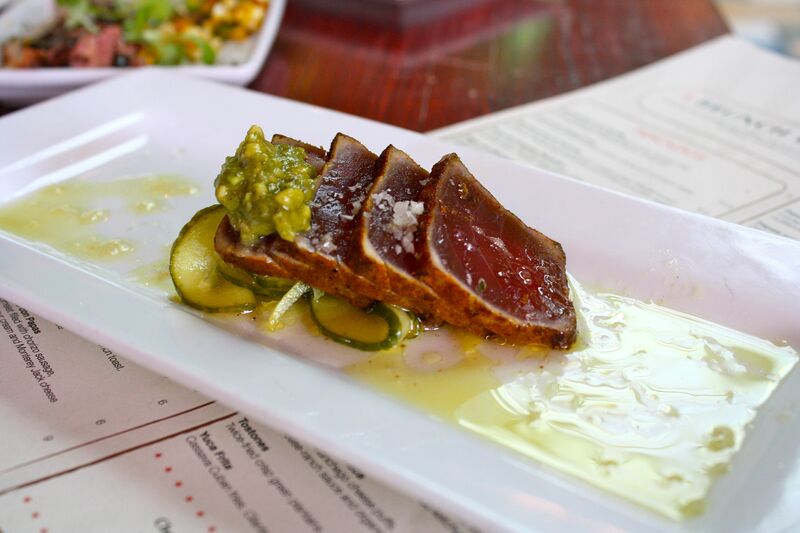 The adobo-rubbed charred tuna was up next. 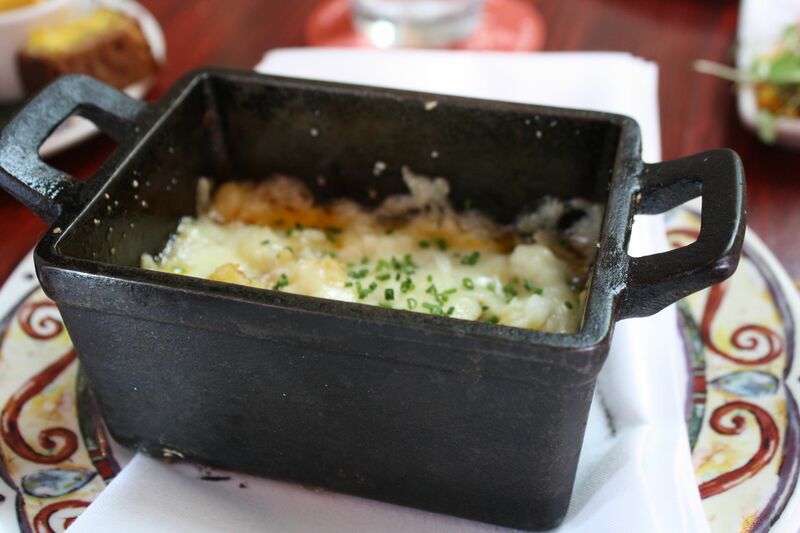 This dish seemed kind of random for a Cuban restaurant, but my mouth didn’t seem to mind. 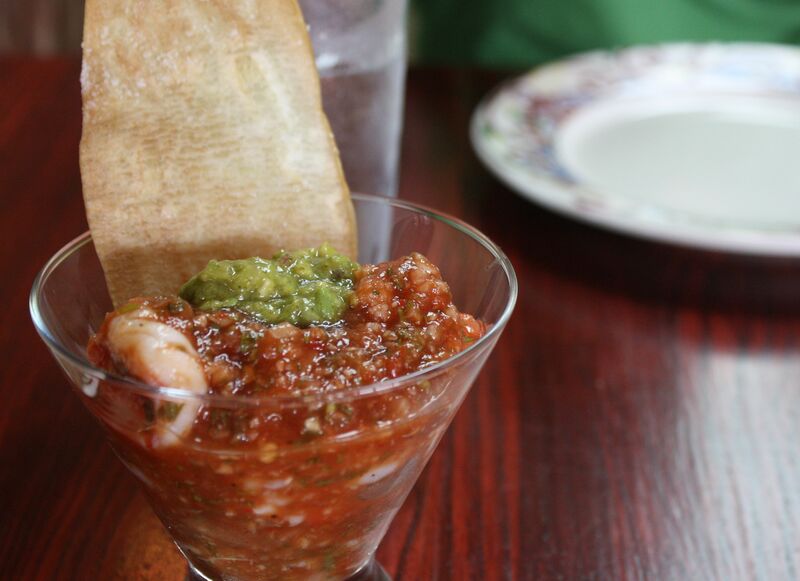 I wish there was just a touch more of the avocado salsa that topped the fish. The next dish was a disappointment, not because it wasn’t tasty but because I had REALLY high hopes for it. I expected the spinach and manchego cheese puffs to be crispier and gooier. Instead, they were more on the doughy side of things. Again, this was a solid dish but just not what I expected. It was around that time we thought we were done. I then, as I’ve been wont to do in the 8 years we’ve been together, surprised my husband by ordering two more dishes. I had been eyeing up the sopa levanta muerto. 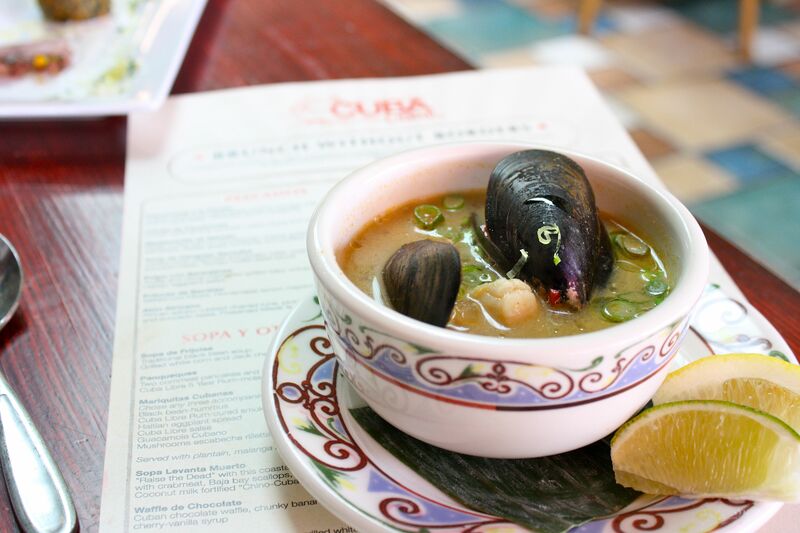 This coconut-based broth was “swimming” with (ooh, that’s a bad pun) crabmeat, mussels, scallops and shrimp. My husband and I did what we do best–I happily slurped the rich and tasty broth while he chomped contentedly on the seafood. 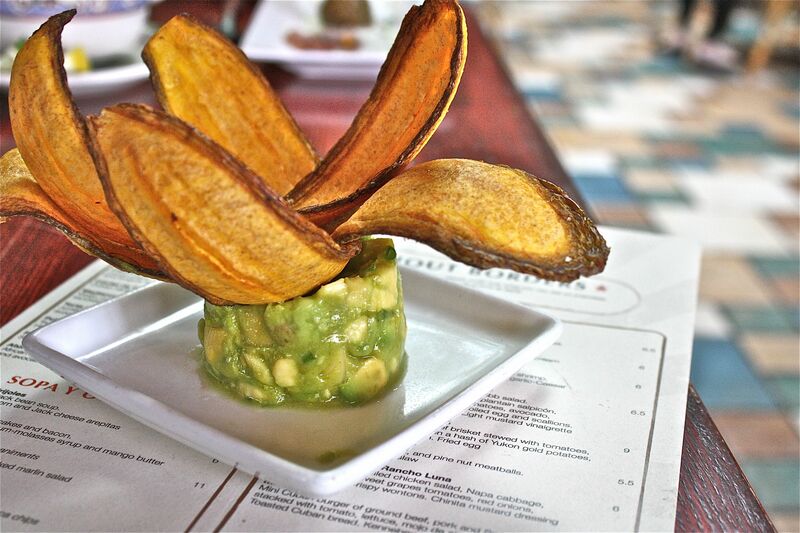 And we couldn’t leave Cuba Libre without trying the Guacamole Cubano with PINEAPPLE (!) in it, served with wavy strips of fried plantains (interesting info about me. I hate bananas with a passion and even hate regular plantains. I love me some friend plantains, though. Always have.) This dish was a light and citrusy end to our meal. Just kidding, just kidding. 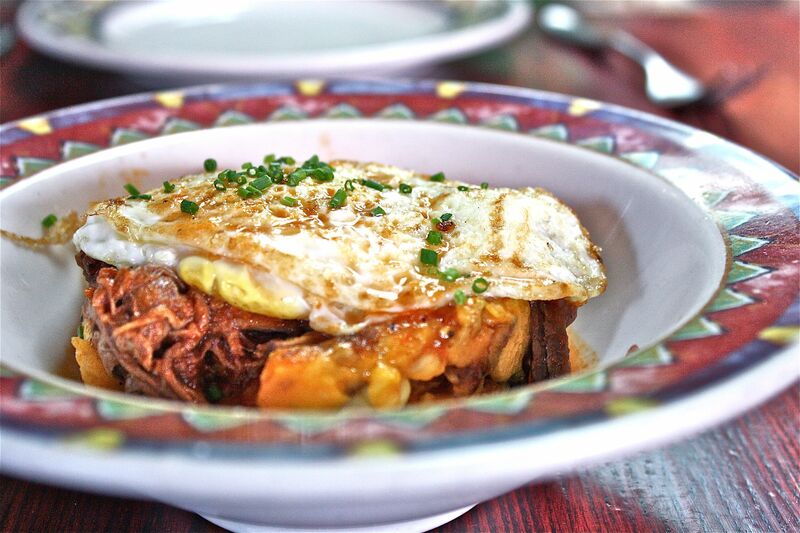 Executive Chef Jasper Alivia–a very nice guy–came by to chat with us and convinced us to try the ropa vieja hash. Our friends, Ryan and LeeAnne, were sitting at a nearby table and I think they sent him over to twist our arms. My husband tried to resist but Chef Jasper said it was his favorite too and besides, it was brisket. You can never pass up brisket! So we ordered our last and really final dish of the day–beef brisket stewed with tomatoes atop a potato hash, topped off with a fried egg. OK fine, everyone. It was delicious. The tomato brought out the sweetness in the brisket and it was my kind of dish; the one where each bite gives you a little bit of everything. What a beautiful way to end our meal. “Ropa Vieja” means “old clothes,” an affectionate term for a tomato-and-tough-but-flavorful-meat-based cooked-until-it-distingrates stewish dish seen in different versions all over the Spanish islands, I think. You hit the jackpot there, Zoe! I used to eat it for lunch 6 stops into Brooklyn on the J train when Bushwick was purely Hispanic. Seriously?! All you can eat for $25? !